Nanowrimo/14 middle of the night…. Destiny in a ball gown with little kitten heels, tapping under the table. The lure of the lap in a new lover. It becomes obvious that you will need this after too much death. After too much pain. The little lure of the flirt, the hidden glance. The little packets of time we are given, the roads into the future, the parting of ways for things more lively, the leaving of sorrows behind. I want to take the sadness away. I don’t want to think about all the years he didn’t love me, years he didn’t touch me. I want to take a lover, by the hand, our hands fresh, clasping, the hidden glances under curled lashes, the tap of the kitten heel, the legs parting slightly, the souris. I want the lover to wrap silk over the wound. A gauze dressing over the pain. The lightness of the kisses, brand new, freshness along the skin, the opening of little locked doors. Happiness in brief. Relationships as footnotes away from pain. Everything begins by charting a course, doesn’t it? This is what I am trying to show you, so that you can stay alive after too much sadness. There is a door you have to close on pain, when too much pain has crept in and stolen your smile. There is a breeze that blows through the curtains when a lover awaits. It makes you want to choose the little heels, the silken drifts of lace, a perfume that lilts. He’s waiting and there is dance in knowing that. I wanted to look at him for hours and hours and hours until I could see everything or know everything and dance him away from hurt like I was dancing away. I wanted to say “let’s swallow life while we can,” the bright gulps of freshness sweeping away the dark curtains of the past. 3:07 am. have to try and go back to sleep, soon. 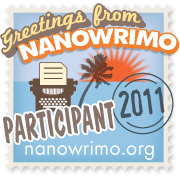 Next: Next post: Nanowrimo/15 — “Dreamstime” at 22350 — heading toward 25,000 the halfway point.